As good as ribs can be when they are cooked on the grill, or even better in a smoker, you can still get pretty results from making ribs in the oven. Since I don’t have access to a grill or a smoker, the oven has really been my only choice and since we really like ribs around here, I have to find new ways to make them great. I have made them in the past with pretty good results, but they never seemed to be that falling off the bone great that you get at good barbecue places or from smoking them for hours. I cam across this recipe at Food.com that changed all of that for me and it can’t get any easier than this one. it is just two ingredients, a couple of steps and letting the ribs do their thing in the oven and you end up with a fantastic result. Preheat the oven to 225 degrees. Place the ribs on a cutting board and season them well with your favorite spice rub, grill seasoning, barbecue rub or salt and pepper, on both sides. Line one large rimmed baking sheet or two smaller baking sheets with aluminum foil. Place the ribs meat side down on the baking sheet or sheets and cover the baking sheets or sheet tightly with aluminum foil, making sure all of the edges are well sealed. Bake the ribs in the oven. 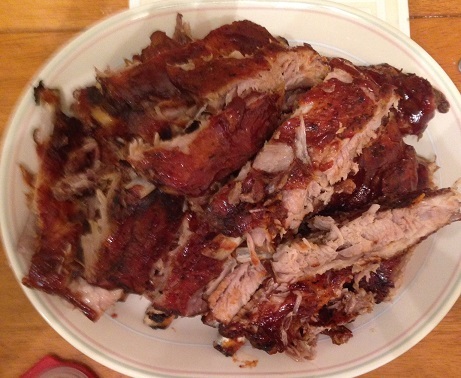 If you are using baby back ribs, bake the ribs for about 3 1/2 hours. For St. Louis style ribs, bake the ribs for about 4 hours. Remove the ribs from the oven and carefully remove the top covering of the aluminum foil. Drain any liquid or drippings from the baking sheet and then flip the ribs over so that they are now meat side up. Be careful flipping the ribs as they will be quite hot and very tender so they may start to fall apart. Paint the ribs with a layer of barbecue sauce and then return the ribs to the oven, uncovered, for an additional 20 to 30 minutes until the sauce has baked in. You can add additional coatings of sauce if you think the ribs need it. Remove the ribs from the oven and gently transfer them to the cutting board. 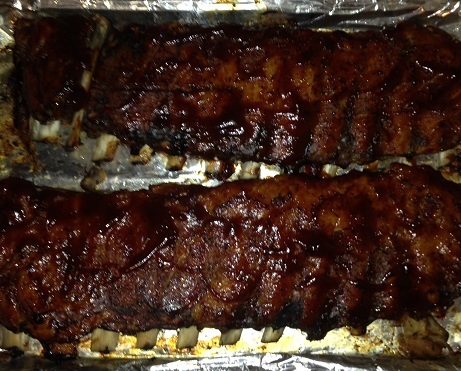 Cut the ribs into 1 or 2 rib sections and place them on a serving platter. Serve the ribs with extra barbecue sauce on the side. I have to say these were among the most tender ribs I have ever had and certainly the best ones I have made at home. They were coming easily off the bone and just melted in your mouth when you bit into them. I used the St. Louis ribs for this recipe since they were on sale here last week and were a lot cheaper than the baby backs. They are a little larger and a bit fattier but I think they have great flavor as well. You can serve these with your favorite recipes of potato salad and baked beans and you have a great meal. All you need to do is put them in the oven, go about your business for a few hours and you have great ribs for dinner.